in Greek and Roman culture that began in Italy during the fourteenth century) concern for representing mass, space, and light. Not much is known about Fra Angelico's early life. He was born around 1400 and was named Guido di Pietro. Around 1418 he and his brother Benedetto took vows to become monks in the Order of Dominican Preachers in Fiesole, Italy, near Florence. 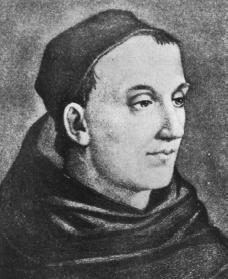 Fra Angelico's religious name was Fra Giovanni da Fiesole. The titles Fra Angelico and Beato Angelico came into use only after his death, as a way of honoring his religious life and work. In the early 1420s Fra Angelico and Fra Benedetto began operating a painter's workshop and a room for copying documents in Fiesole. Many of Fra Angelico's early works were created at the monastery (a house for persons who have taken religious vows) of San Domenico in Fiesole. The Annunciation of about 1430 and the Linaiuoli Altarpiece (Madonna of the Linen Guild) reveal the directions of Fra Angelico's art. His gentle people are modeled in chiaroscuro (the arrangement or treatment of light and dark parts), and these saints and angels stand out from the rest of the picture. Numerous large altar-pieces (works of art that decorate the space above and behind an altar) were ordered from Fra Angelico and his popular shop in the 1430s. From 1438 to 1445 Fra Angelico worked on frescoes (paintings done on moist plaster with water-based colors) and altar-pieces for the Dominican monastery of San Marco in Florence. The church and monks' quarters were newly rebuilt at this time under the supervision of Cosimo de' Medici, with Michelozzo as architect for the project. The frescoes by the master and his assistants were placed throughout the corridors, chapter house, and rooms. In the midst of the traditional subjects from the life of Christ, figures of Dominican saints meditate (focus all their thoughts) upon the sacred events. At the same time the dramatic effect is increased by the inclusion of architectural details of San Marco itself in some of the scenes. A masterpiece of panel painting created at the same time as the San Marco project was the Deposition altarpiece, requested by the Strozzi family for the Church of Sta Trinita. The richly colored and shining figures, the wide views of the Tuscan landscape serving as a backdrop to Calvary, and the division into sacred and nonreligious people reveal Fra Angelico as an artist in tune with the ideas and methods of the Renaissance. Yet all of the accomplishments in representation do not lessen the air of religious happiness. The final decade of Fra Angelico's life was spent mainly in Rome (c. 1445–49 and c. 1453–55), with three years in Florence (c. 1450–52), as prior (second in command of a monastery) of San Domenico at Fiesole. His main surviving works from these final years are the frescoes of scenes from the lives of Saints Lawrence and Stephen in the Chapel of Pope Nicholas V in the Vatican, Rome. The dramatic figure groupings serve to sum up the highlights of the long tradition of fourteenth-and early fifteenth-century Florentine fresco painting. In the strict construction and rich detail of the architectural backgrounds, the dignity and luxury of a Roman setting are shown. In spite of the fact that Fra Angelico's life unfolded in a monastic environment, his art stands as an important link between the first and later generations of Renaissance painting in Florence. Pope-Hennessy, John. Fra Angelico. 2nd ed. Ithaca, NY: Cornell University Press, 1974. Spike, John T. Fra Angelico. New York: Abbeville Press, 1996.